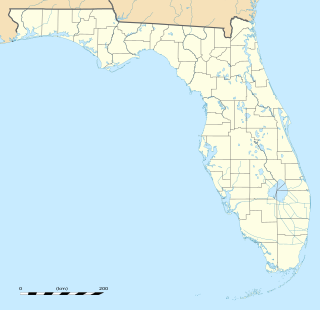 Eau Gallie High School is located at 1400 Commodore Blvd in the Eau Gallie area of Melbourne, Florida. It is one of four public high schools in Melbourne, along with Melbourne High School, Palm Bay High School, and West Shore Junior/Senior High School. The 2003 NFL draft was the procedure by which National Football League (NFL) teams selected amateur college football players. The draft is known officially as the "NFL Annual Player Selection Meeting" and has been conducted annually since 1936. The draft was held April 26–27, 2003 at the Theatre at Madison Square Garden in New York City, New York. The league also held a supplemental draft after the regular draft and before the regular season. Michael Troy Williams is a former American football wide receiver who played in the National Football League (NFL). 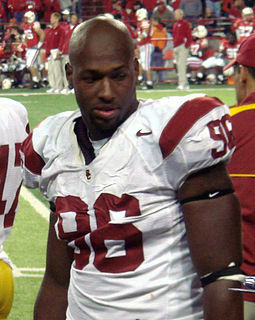 Williams played college football at USC, and received consensus All-American recognition. The Detroit Lions selected him in first round of the 2005 NFL Draft, and he also played for the Oakland Raiders, Tennessee Titans, and Seattle Seahawks of the NFL. Idrees Kenyatta Walker is a former professional American football player who was an offensive tackle in the National Football League (NFL) for six seasons. Walker played college football for the University of Florida. A first-round pick in the 2001 NFL Draft, he played professionally for the Tampa Bay Buccaneers of the NFL. David Brian Rimington is a former American college and professional football player who was a center in the National Football League (NFL) for seven seasons during the 1980s. Rimington played college football for the University of Nebraska, where he was two-time consensus All-American and received several awards recognizing him as the best college lineman in the country. He was selected in the first round of the 1983 NFL Draft and played professionally for the Cincinnati Bengals and Philadelphia Eagles of the NFL. Rimington is the namesake of the Rimington Trophy, which is awarded annually to the nation's top collegiate center. Rimington was announced as the interim athletic director of Nebraska on September 26, 2017. Greg Eslinger is a former American college and professional football center who last played for the Cologne Centurions of NFL Europa. He played college football for the University of Minnesota, received consensus All-American honors, and was recognized as the best college interior lineman and top college center. He was chosen by the Denver Broncos in the sixth round of the 2006 NFL Draft, and was a member of several National Football League (NFL) teams, but never played in a regular season NFL game. Troy McHenry Walters is an American football coach and former player who is currently the offensive coordinator at the University of Nebraska–Lincoln. Walters played was a wide receiver and punt returner in the National Football League (NFL) for eight seasons. Walters played college football for Stanford University, was a consensus All-American and was recognized as the outstanding college wide receiver in the country. He was selected in the fifth round of the 2000 NFL Draft by the Minnesota Vikings, and also played professionally for the Indianapolis Colts, Arizona Cardinals and Detroit Lions of the NFL. Andre Bernard Gurode is a former American football center and guard who played 11 seasons in the NFL. He played college football for the University of Colorado, earning consensus All-American recognition. The Dallas Cowboys selected him in the second round of the 2002 NFL Draft. He is a five-time Pro Bowl selection, and has also played for the Baltimore Ravens, Chicago Bears, and Oakland Raiders. Cooper Morrison Carlisle is an American former college and professional football player who was a guard in the National Football League (NFL) for thirteen seasons. Carlisle played college football for the University of Florida, where he was a member of a national championship team. He was drafted in the fourth round of the 2000 NFL Draft by the Denver Broncos, and has played professionally for the Broncos and Oakland Raiders of the NFL. Stacey Dales is a Canadian former basketball player and a current reporter on the NFL Network. Dales was born in Collingwood, Ontario, and raised in Brockville, Ontario. Travis Edward Dorsch is a former American college and professional football player turned academic who was placekicker and punter in the National Football League (NFL) for two seasons during the early 2000s. He played college football for Purdue University, and was recognized as a consensus All-American. The Cincinnati Bengals picked him in the fourth round of the 2002 NFL Draft, and he played professionally for the Bengals and Green Bay Packers of the NFL, and the Rhein Fire of NFL Europa. Lawrence Christopher Jackson is a former American football defensive end who played in the National Football League (NFL). He was drafted by the Seattle Seahawks in the first round of the 2008 NFL Draft. He played college football at USC. Carlos Antonio Huerta is an American former college and professional football player who was a placekicker in three different professional leagues. He played college football for the University of Miami, and was recognized as an All-American. Drafted in the twelfth round of the 1992 NFL Draft, he played in the National Football League (NFL), Canadian Football League (CFL) and Arena Football League. Gary Earl Huff is a former professional football player. He graduated from Leto Senior High School in Tampa, Florida and played college football and baseball at Florida State University before becoming a professional football quarterback and coach. Huff's jersey number while playing football for Florida State University was "19." Torrance James Marshall is a former professional American football player. He played high school football at Miami Sunset Senior High. He played college football at the University of Oklahoma and was the MVP of the 2001 Orange Bowl. In the past, he has played in the National Football League, primarily as a linebacker for the Green Bay Packers. He is the nephew of former NFL player Harvey Clayton. Myron Rolle is a Bahamian American former football safety. 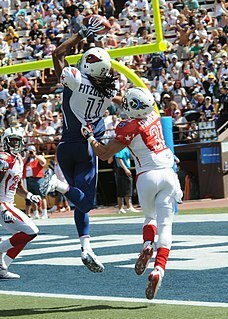 He was drafted by the Tennessee Titans in the sixth round of the 2010 NFL Draft. He played college football at Florida State. He attended the Florida State University College of Medicine and is a neurosurgery resident at Harvard Medical School/Massachusetts General Hospital. Wallace Herman "Wally" Richardson is a former American football quarterback. Jerry Ray Hughes Jr. is an American football defensive end for the Buffalo Bills of the National Football League (NFL). He played college football for Texas Christian University (TCU), where he was recognized twice as a consensus All-American, and was drafted by the Indianapolis Colts in the first round of the 2010 NFL Draft. Eric Wood is a former American football center. He played college football at the University of Louisville and was drafted in the first round of the 2009 NFL Draft by the Buffalo Bills of the National Football League (NFL). Wood played nine seasons in the NFL, including a Pro Bowl appearance, before retiring following the 2017 season due to a neck injury. Cooper Taylor is an American football safety who is currently a free agent. He played college football at Georgia Tech before transferring to Richmond. He was selected in the fifth round by the New York Giants of the 2013 NFL Draft. Myles Lorenz Garrett is an American football defensive end for the Cleveland Browns of the National Football League (NFL). He played college football at Texas A&M, and was drafted by the Browns first overall in the 2017 NFL Draft.